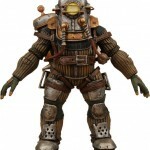 NECA has posted up pics and info for wave 2 of their Bioshock 2 figures. This set includes Subject Delta Plush Replica, Big Daddy Rosie, Little Sister and Eleanor Lamb 2-pack, and a Ladysmith Splicer. Hot on the heels of our Big Daddy Bouncer plush replica and the EVE Hypo Syringe, we’ve got a whole new wave of BioShock items due this summer! Based on the 2k Games smash hit, BioShock 2, our latest wave of BioShock items are bigger and more detailed than ever before — and in the case of the Subject Delta plush, also more adorable. At over seven inches tall, Subject Delta is the sequel to the Big Daddy Bouncer plush replica. It perfectly captures the look of Little Sister’s doll from the game. Comes complete with a baseball head, corkscrew drill arm and a wristwatch face. For those looking for a little more action (figures), we’ve got our Series 2 assortment, which features an Eleanor Lamb and Little Sister two pack and a 7″ Ladysmith Splicer that comes with a tommy gun, rolling pin and a removable mask. The Little Sister and Eleanor Lamb stand 3 3/4″ and are fully articulated. Accessories include ADAM syringes and two small Big Daddy dolls for the girls to hold. And then it’s time to get deluxe. Big Daddy Rosie is loaded with articulation and tanks that plug into the back. This enormous figure also comes with the Rivet Gun accessory that she can hold in her right hand. This is the biggest and baddest Big Daddy yet! All these new BioShock items will hit stores late June or July. Check out photos by clicking the headline of the story.